Steel Push Pier Installation is a type of foundation repair product that is used in many homes in this area. Steel push piers are also commonly referred to as resistance piers. These structural piers can be installed with relatively quiet hydraulic equipment. All of the installation equipment is highly portable and can be easily transported right to the job site. As soon as all of the steel push piers have been installed and load tested, the structure can immediately be lifted onto the supports. No waiting for concrete to cure and no soil has to be removed from the site. Because of the load test, you get verified structural support for years to come. 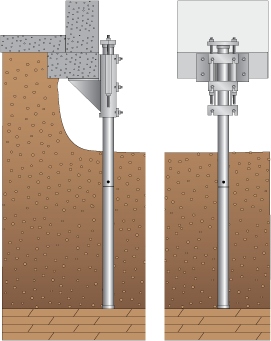 One of the advantages of using push piers for foundation repair is that the installation process uses quiet hydraulic equipment to install the steel piers. All of the installation equipment is highly portable and can be easily transported on the job site. After all of the steel push piers are installed and load tested, the structure can be immediately restored/lifted by transferring the load of the home to the piers. There’s no time wasted, waiting for concrete to cure, and no soil to remove from the site. A measured factor of safety is verified, as the piers are 100% load tested to a force greater than the actual working load. This means that you will get verified structural support for many years when you require steel push piers to be used on your home’s foundation. 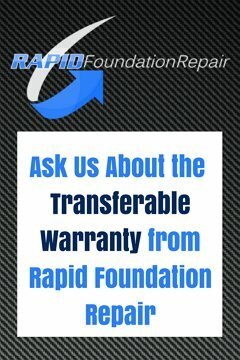 Rapid Foundation Repair only uses the best products manufactured right here in the USA by Earth Contact Products. 1. Site survey: Pier placements are located around the structure and the location of underground utilities verified. 2. Excavation: Small excavations or the entire perimeter is dug for access at each placement location. The space required at the foundation is usually about 3 feet square. 3. Prep foundation: This includes notching the concrete footing to place the push pier bracket under the stem wall, preparing the bearing area under the footing to a smooth and level condition, and adjusting the face of the stem wall to vertical at the point of bracket attachment. 4. Bracket Attachment: The steel resistance pier bracket is secured to the footing using anchor bolts. Attachment of the drive stand and the hydraulic cylinder that is used to force the pier pipe into the soil is mounted on the drive stand. 5. Push Pier Installation: The steel pier is advanced into the soil using the structure as the reaction force with a 10,000 psi hydraulic pump and cylinder combination. The piers may be installed from outside or inside the structure. Pier installation continues until rock or suitable bearing stratum is encountered below the unstable soil near the surface. 6. Load Test: Every resistance pier is load tested by increasing the force on the pier to ensure the rock or bearing-strata will support a load greater than needed to guarantee a factor of safety. Typically an engineer will determine the load of the structure and the desired factor of safety before the load tests are performed. 7. Prep for Restoration: Once all push piers have been installed, load tested, and the installation data at each placement recorded; lifting head assemblies and hydraulic lifting rams are placed on the steel piers. The lifting cylinders are connected with one or more manifolds and operated using a hydraulic pump. 8. Restoration: Under careful supervision, the load is transferred from the existing failing strata under the foundation, to the load tested piers. The structure can be transferred gently and evenly lifted to as close to the original elevation or to the recommendation of the engineer. The nuts at the pier caps are secured at each placement and the lifting equipment is removed. 9. Clean Up: The soil that was excavated at each steel push pier placement is now replaced and compacted. The site is left clean and neat. We can help you determine if the installation of steel push piers is right for your foundation repair issue. Each foundation problem is different, and we will make sure to find a foundation repair solution that fits your specific needs, whether it is a home foundation repair job or a garage foundation repair job. When it’s time to get a professional to your home for the expertise needed to install steel piers in South Dakota, Wyoming, and Nebraska, call Rapid Foundation Repair today for your FREE estimate.